Richard Clark. Trinidad: ‘Before this time I couldn’t look directly into His eyes, however from then till this day when I look at His eyes, all I see are diamonds’. You know us over janmas.. past & future.. how different we are from each other. But we don’t. So, when we see you treating each of us differently, we compare & ask.. Why is He doing this to me only? Why not to others? How stupid! Bhavatitam trigunarahitam Sadgurum tam namami !! Miillions of humble prostrations to the lotus feet of Parama Pujya Sadguru Govinda !! Jai Guru Datta Puttuji ! !This colourful and bright MMS together with the fact that Appaji is also going to be here during the Festival of lights fills our heart with joy and warmth !! Thank you for another great MMS for Sunday meditation !! Sri Guru Datta ! !Om Namo Hanumathe Namaha !! Jaya Guru Datta, Swamiji. Over the years, many times I have seen you instruct devotees to do or not do certain things that didn’t correspond with what they wanted for themselves. Sometimes they didn’t listen and it has lead to dire consequences. Observing this has taught me to always listen when you give instructions. So often devotees try to second guess you and change your instructions to suit themselves. Many times I have seen devotees say “well, Swamiji doesn’t really know how things work here, or doesn’t really understand this or that….Oh the confusion that follows! Sometimes when you ask us to do certain things it is difficult. When you asked me to stay home from the Lincoln Center Concert while you let others go, it was very hard, especially since I love New York so much and spent much time at the theater as a young girl. Nevertheless, I watched from afar, trusting that you had an extremely good reason to keep me away from that occasion. It isn’t always easy to sit still, accept and listen while others get to do what you are longing to do, but experience and observation has taught me that it is the right thing to do. You are always only working for what is good for us…. It’s that what I like very by Swamiji: He knows what is good for me. I can do some practeses, which I can really do and which helps me. The programs are individuel. If I like Bhajans, I can work with Bhajans. If I like Mantras, I can work with mantras. So I don’t must make things, which are difficult for me and with which I don’t feel good. When I have a practese, I know, that it will brings a lot to me. I am very happy about this. With Swamiji I feel very secure in my way! Humble Prostrations to the Lotus feet of Gurudeva.. Om Namo Hanumate Namaha. Beautiful message to remind us you are always thinking about us and guiding us is all the time.. Love you Appaji! Wow, what a special shower of blessings, it is like Happy New Year and Happy Birthday together. My humble prostrations to the Holy Feet of Sri Swamiji. Today’s musical composition is Sri Swamiji’s bhajan, “Saptasvarudham Nakshatramalam,” which explains the tattva of Sun God. As the Sun God is emanating His eternal rays on all life forms, so is our Sadguru emanating His eternal rays of jnana (knowledge) to uplift all life forms. Also, our compassionate Master is tailoring these life lessons to suit every individual’s needs. Thank you Appaji for a beautiful visual, musical preaching. JGD.The MMS again brings to my mind the Ramayana.The first name that comes to my mind is Sage Valmiki. This great poet saint was a robber. The celestial Sage and Maharshi Narada Taught him the Rama nama Mantra.The dacoit Valmiki could not pronounce single, simple word Rama.He was chanting Mara,mara,mara which gradually became Rama.When the mantra gave enligtenment to Valmiki He wrote the great epic Ramayana.Here Maharshi Narada did not preach Valmiki who is illiterate great sounding complecating mantra.But a simple Two letter word. In the 2nd instance of Hanuman.Here Hanuman choose The Sun God as His Guru.He asked Sun God to teach Him.The Sun tells Maruthi that He goes round the Mount eru in His 7 horsed chariot and ask Hanuman can follow him so that He can teach him.Here Hanuman agrees and learns from the Sun God. The Sun knows the capability of Hanuma and so accepted him as a student. Appaji we all are always thinking of others and always jelous of others as we only see the outer world and not the inner as you see and bless all of us equally. But we feel that we are not treated well just comparing to others. JGD. Jaya Guru Datta, Sri Guru Datta! JGD. Efficient teacher has the complete knowledge about the subject to be taught and how, depending on the student, because competence and interest of each student varies. In a class each students understand the lesson by teacher, according to their attention on teacher’s lesson and intellect of the student. Similarly, spiritual lessons also are different for each person depending on the intellect and their experiences in life. It would be amazing if God takes a form to help all of us, as an efficient teacher for spirituality at every phase of our life. May lord bless us all with timely guidance towards righteousness and spirituality. dear Swamiji many times I experienced that in your teachings I felt that you did only speak to me. Sometimes you explained somethings that I was thinking of days or weeks before. I know this is part of your silent teaching. Always you are with us and know what is best for us! May we all understand your way of teaching and grow together. Thank you for taking me into your boat – your are a very good capitan. I trust you completely. With love you treat each and every one of us so that we escape this cylce of birth and death. And yet because we are ignorant we wonder sometimes. Please pardon us and give us good thoughts by remaining in hearts and minds and controlling both. With humility I surrender at your Lotus Feet. I seek only your refuge. Whatever you are doing is for my betterment. You are there to fend for me. Dear Puttuji, Thank you for explaining how and why our Sadgurudeva who also is the Universal Doctor offers varied treatment for each of us. Your clarity of explanation is absolutely unmatched !! Like Sage Narada, you explain to us Sadgurudeva’s divine play. Heartfelt gratitude to you! Jaya Guru Datta! It is beyond our imagination and yet it is true: You, Sadgurudeva, know everything. So, only You know who needs which specific treatment according to his / her needs. That’s the power of a true master to teach individually! I pray to even better take wahtever preaching You have for me. Sadgurudeva, please pardon me whenever I was jealous of someone getting a treat from you. Please strenghten my ability to be happy for that person instead. There is enough Swamiji and His endless love & compassion for everyone. It is there at all times. We all know this and yet forget it… Sri Guru Datta! Sri Swamiji is giving so much to us. His wonderful music, the divine MMS each day, He comes into our dreams and He teaches us by using so many different ways of communication. Everything what He is doing is simply fantastic. The great statue of Lord Hanuman in the Mysore ashram is so great, resplendent with power and love. Our Sadgurudeva island master physician who gives different medicines to cure the ills of different patients. Many times it is puzzling to see the different treatment meted out to different devotees. Sometimes we compare ourselves and either feel inferior or superior to others. If we trust in HIM and his love for us, we know that we always get what we need .Yet it is amazing how he can answer our questions, and give directives and advice that seems to be for us only, during a general discourse to thousands of people. How great is our Sadguru! Om namo Hanumate namaha. Jaya guru Datta. Jaya Guru Datta. Dearest Mother Sri Swamiji, I seek refuge at your lotus feet. I am too ignorant to know what is best. Please let me trust You completely. Let me follow You completely and with pure devotion. I love you, I love you, I love you. Om Namo Hanumate Namaha. Sri Guru Datta. According to me today’s MMS is more or less connected to MMS 153also. 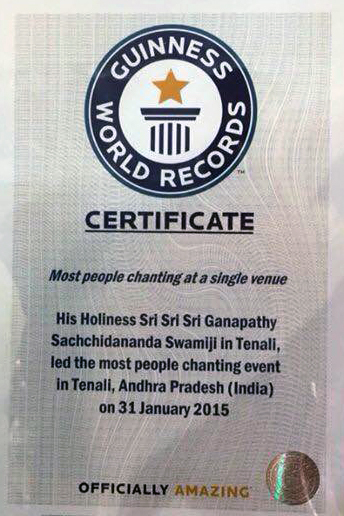 This is because in today’s MMS, Appaji has stated that His preaching or teaching will vary from person to person. Basing on that He asked to do practice anything with complete trust on Him. The photography and the music are very apt to the MSG as explained by you, Puttuji Here i remember Appaji’s words saying that each persons karma is different from others and it is already decided by God when you have got this human birth. Therefore in your life you have to face both the good and bad. It is a circle and when good things happend you should not get Ego or arogance and at the same time when we face any bad incident or anything in our life we should not leave our courage and the balance of mind. Here we should remember the importance of Sadguru who will guide you in both good and bad periods and you have to follow the same strictly. Similarly while Appaji is performing Healing music concert He will suggest for each person who are suffering from any chronic disease to listen a perticular Raga which will vary one to another to get remedy from it. Therefore Appaji we got your concept and follow your teachings and will not get disturbed our mind for unwanted desires which are not not actually needed for us. JGD. There is equality in all your words, actions and thoughts dear Appaji…. Das finde ich sehr tröstlich. So brauche ich mich „nur“ vertrauensvoll DIR zuzuwenden und bekomme das Beste, das Zutreffendste für meinen Weg. Mein SADGURU, ich verneige mich und danke DIR von Herzen. Very true…. many times we compare with others or not satisfied with Sri Swamiji’s answer. Pujya Sri Swamiji who know our past, present and future is the best judge for our life. Lucky are we to have such a Guru. Thank you Appaji for this excellent MMS video message. Who else can tailor make lessons to suit each one of His students. It is amazing how each of us interprets each of these MMSs in a various different ways. It is His provocation and our need that makes us interprets the meaning of these MMSs. In my experience when Appaji is instructing something to someone and another person standing in close proximity does not need that instruction, Appaji makes the unwanted person go blind and deaf for that moment. Just to show that His lessons are customized. Yet in some other way, He would be speaking to me at a given moment, but the person next to me may have needed that lesson and so i am made deaf and blind. Myriad are This guru’s ways. It takes perseverance to pursue His teachings. Thanks Appaji for making me worthy of your lessons. Pranams. Jaya guru datta. Appaji is the best doctor in the world..we are all patients in desperate need of His medicine. The doctor knows what we need and when we need and why we need. We are very happy with all the medicines we received and will receive …Thank You Appaji!